Two of springtime’s culinary joys are contained in this frittata: green garlic and asparagus. While most of us are familiar with asparagus, the green garlic remains a mystery to many. Green garlic is the young garlic plant that the farmer pulls out of the soil as he thins his rows in the spring. The white part of the stalk and the tender green section just above it can be used like you’d use green onions and leeks. Frittata with green garlic, asparagus and bacon. 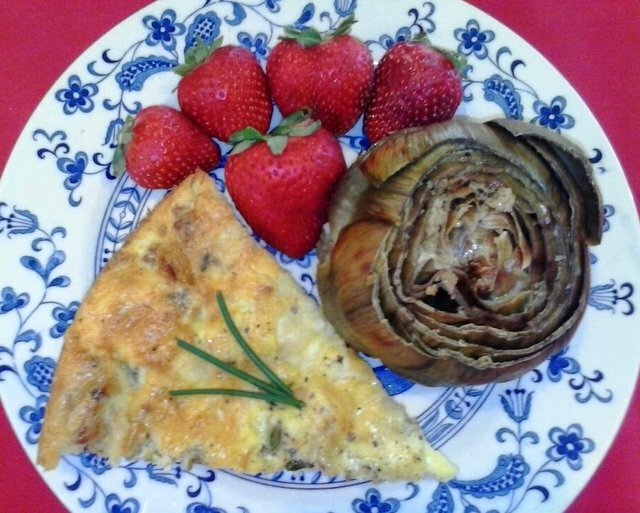 Served with strawberries and an artichoke. Heat oven to 350 degrees F. In a large skillet, saute bacon for 4 minutes. Add green garlic and onion; saute 5 minutes longer. Add asparagus and cook another 4-5 minutes, or until onion begins to turn golden and bacon becomes crispy. Remove from heat. While the bacon and green garlic are cooking, crack the eggs into a bowl and discard the shells. Add milk, salt and pepper; whisk until smooth. Spread bacon mixture evenly in the bottom of an 11-inch round baking dish. Pour blended eggs into baking dish. Sprinkle Swiss cheese evenly over the eggs. Place the frittata into the oven and bake 20-25 minutes or until the eggs are cooked thoroughly. Remove from oven. Cool for 10 minutes before slicing into 8 wedges. Serve warm, or refrigerate for 4 hours (or overnight) and serve cold. Makes 8 servings.